There are some things that you just can’t replace with technology. Although there is something to be said about convenience, better efficiency and less elbow grease needed — sometimes you just need to go back to how you grew up and “kick it old school”. 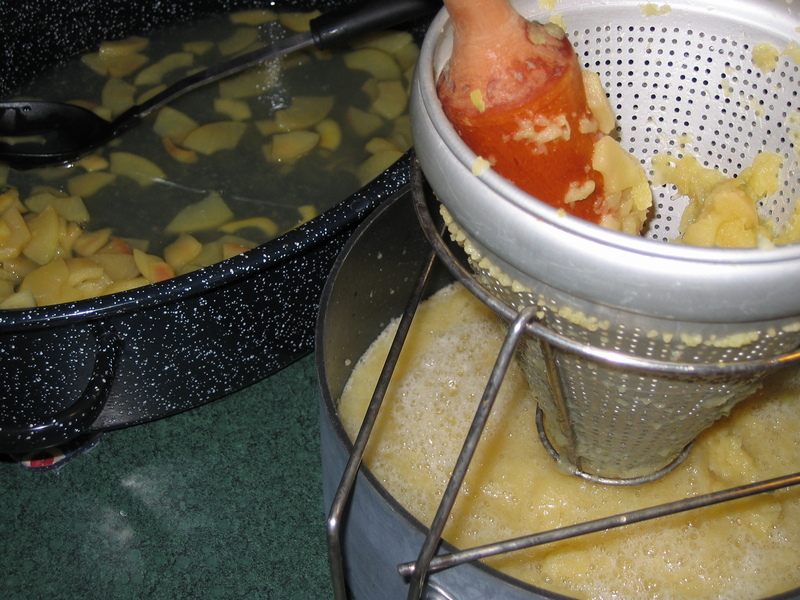 There’s just something about making applesauce this way — pushing it through the chinois (I learned a new word today — I just always called it a sieve/strainer!) gives it a texture reminiscent of my Grandma’s applesauce recipe and completely removes all those pesky bits of apple peel that happen when you let your child run the apple peeler. Yesterday we cooked down almost 3 roaster pans full of apples — from the tree in our backyard — and ended up with 10 pint jars of delicious applesauce. Today we tackle it again in an attempt to finish off the apples in the garage.